There are few foods more universally satisfying than starches. Who doesn’t love mashed potatoes, or biscuits, rice, or even millet? Billions of people probably start their days with oatmeal, rice, cream of wheat, or grits. It fills our bellies and satisfies our hunger gently without challenging us or forcing us to pay too much attention early in the morning. 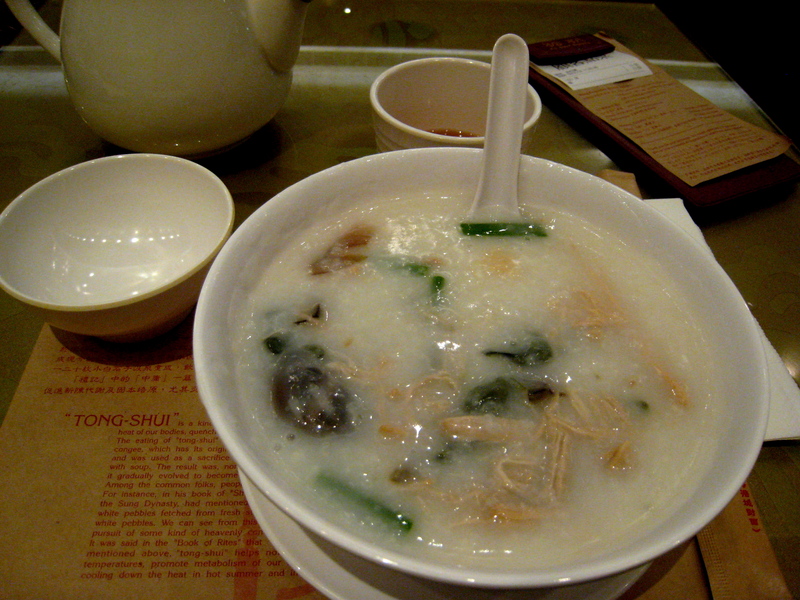 I started my day with a delicious bowl of congee this morning at Sweet Dynasty on Canton Road in Hong Kong. Green onions, shitake mushroom, smoky, salty shreds of pork and rich gelatinous preserved egg elevated the rice porridge from a serviceable Asian breakfast to simply delicious. Each bite was a little different and as I sat there slurping my porridge looking through the menu at the 25 other congee options that I had had to forgo, I started thinking about their similarity to grits. Grits are one of my favorite foods. Oft-maligned for being boring and well, gritty, this mainstay of the Southern table is to often misunderstood and sadly often mis-cooked. Take any starchy dish- potatoes, rice, taro, and underseason it, and anyone will hate it. But with a little salt and butter, you have a blandly handsome bowl of goodness- the Ben Affleck of hot breakfasts if you will. But then there is shrimp and grits, grillades and grits, even sausage egg and cheese grits and now you’re talking Johnny Depp-like gorgeousness. Same thing with congee. It’s all in the add-ins. I had to pass up congee with fish belly, congee with salted pork and oysters, and congee with chicken and mushrooms today and that’s just three possibilities. Seafood congee is as fabulous as the ingredients make it. I think I’m going to have to go back and work my way through a bit more of that menu while I’m here. The Ben Affleck of hot breakfasts… You slay me. I want some. Is this photo the congee you ate? Now you have me craving sausage, egg, and cheese grits. The Japanese verson is called okai, which we were fed when we were sick. But my Mom or Grandma did not add much other than a little bit of salt!!! Also known as juk in the states, several juk specialty shops exist, even here in SF Chinatown.